What are terpenes? 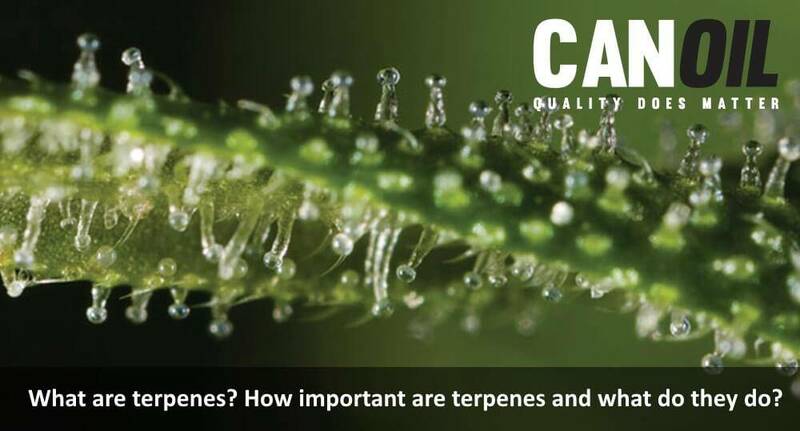 How important are terpenes and what do they do? Terpenes are aromas and flavourings found in around 50,000 different plants. They are volatile aromatic substances that give each type of cannabis its own characteristic smell and taste. The cannabis plant contains +/- 140 - 200 different terpenes. Terpenes are often used as aromas and flavourings in all kinds of essential oils, perfumes, foods, skin care products and its positive effect with other cannabinoids. In addition to the natural aromas and flavours, terpenes can also have a beneficial effect. Terpenes themselves can influence certain receptors and neurotransmitters, or can interact with cannabinoids. Terpenes would inhibit the reuptake of serotonin, just like Prozac does. And like antidepressants, terpenes enhance noradrenaline activity. Terpenes are also said to enhance dopamine activity, as is GABA, the "inhibitory" neurotransmitter. Terpen is often used with CBD because these two substances reinforce each other, which is called the entourage effect. In other words: one or a few active substances in cannabis will not be able to reach their full potential because they depend on other substances. Terpenes can have a calming, antibacterial, anti-inflammatory, insect world effect. Caryophylene gives black pepper its spicy scent. It acts as a painkiller and anti-inflammatory and is known for its antifungal and antibacterial properties. Caryophylene reduces the anxiety caused by a (too) high THC content. Research (in mice) has shown that beta-caryophylene can be a good remedy against anxiety and depression. Beta-caryophylene can activate the CB2 receptors, which play a role in regulating our emotions. Together with CBD, beta-caryophylene would have a painkilling effect. Also occurs in: black pepper, clove, oregano, turmeric, basil, St John's wort, ginger, chamomile, peppermint, thyme. Assumed medicinal properties: antifungal, antibacterial, anti-inflammatory, analgesic, soothing, antispasmodic, nerve protecting, reduces anxiety, antidepressant. The name eucalyptol is a derivative of eucalyptus, a plant species known for its fresh, camphor-like smell. Eucalyptus essential oil contains no less than 70-90% eucalyptol. Eucalyptol has a cooling taste and is, because of its expectorant properties, often used in cough drinks. It is effective for asthma and bronchitis and has cough suppressant properties. Eucalyptol is analgesic and fever-reducing and has a disinfecting and anti-inflammatory effect. Eucalyptol also works, because of its antibacterial effect, well against tooth decay (cariogenic). Too high a dose can cause nausea and cramps. Also found in: eucalyptus, thyme, mint, rosemary, sage, camphor, basil, tea tree, bay leaf. Assumed medicinal properties: expectorant, cough suppressed, analgesic, fever-reducing, anti-inflammatory, disinfectant, antibacterial. Oranges, and other citrus fruits, owe their fresh citrus scent and taste mainly to limonene. This valuable terpene contains many medicinal properties. It is not only refreshing and invigorating, it is an expectorant, has a calming and sleep-inducing effect, is an antidepressant and can suppress anxiety and anxiety. Limonene is antispasmodic, can detoxify the liver, promotes digestion, has a protective effect on the stomach and lowers cholesterol and blood pressure. Limonene also strengthens the immune system, acts as an antioxidant, stimulates healthy cell growth and slows down wrinkle formation. Also occurs in: citrus fruits, rosemary, mint, ginger, turmeric, chamomile. Assumed medicinal properties: anti reflux, antispasmodic, expectorant, expectorant, calming, suppressed anxiety and restlessness, sleep-inducing, antispasmodic, helps the body detoxify the liver and keep the gall bladder in optimal condition, stimulates digestion, lowers cholesterol, lowers blood pressure, strengthens immune system, cell rejuvenating (stimulates healthy cell growth and slows wrinkle formation), and many others. Lavender, in which this terpene is common, has been used as a sedative for centuries. Linalool reduces feelings of anxiety and stress, promotes a good night's sleep, is anti-convulsive (reduces epileptic seizures) and analgesic. Furthermore, linalool is antibacterial, fungicidal and antihistaminic (it suppresses allergic reactions). Linalool is also used to fight pests. Also found in: lavender, mint, rosewood, birch, thyme, rosemary, ginger, St John's wort, coriander, wild chamomile and about 200 other medicinal plants and herbs. Assumed medicinal properties: soothing, anxiolytic, anti psychotic, anaesthetic, expectorant, analgesic, analgesic, anti-convulsive, reduces spasms, antibacterial, fungicidal, suppresses allergic reactions. The typical smell of beer is due to the presence of myrcene in hops. This powerful painkiller and also has a sleep-inducing effect. Myrcene strengthens the anti-inflammatory properties of CBD, strengthens the muscle relaxing and psychoactive effects of THC and would strengthen the anti-cancer properties of both CBD and CBG. Also, Myrcene would have anti oxidative and antibacterial properties. In combination with the terpene 'thujone', myrcene could counteract symptoms of diabetes. Myrcenes are broken down by the same family of enzymes (the 'cytochrome P450 enzymes') as THC, which strengthens the medicinal effect. However, this can also cause the so-called 'couch-lock' phenomenon: weed with more than 0.5% myrcene would at high doses give a feeling of no longer being able or willing to get up from the bank. This, as it were, forced rest could be interesting for some medicinal cannabis users. Beta-myrcenes would lower the resistance of the blood-brain barrier, allowing cannabinoids to be absorbed better. Myrcenes would not occur in hemp, but all the more in weed, especially the Indica varieties. Also occurs in: mango, hops, lemongrass, bay leaf, thyme, rosemary and chamomile. Assumed medicinal properties: anaesthetic, analgesic, soporific, muscle relaxing, antibacterial, antioxidant, antiseptic, reduces epileptic seizures. Quinene is common in conifers and has a dilating effect on our airways, making it easier and especially deeper breathing. It is an important substance in the physiology of many plants and animals. By a chemical reaction with other substances, other terpenes and components would be formed. Quinene has anti-inflammatory and antibacterial properties. It has a relaxing effect and could reduce epileptic seizures. Pineen has a stimulating effect on the cerebral blood circulation and stimulates concentration and memory. Furthermore, pineen is vomiting and stomach protective and is used as an insect world remedy. Pineen is also thought to counteract the psychoactive effects of THC. Also found in: pine trees, fir trees, saffron, parsley, rosemary, sage, mint, valerian. Presumed medicinal effect: dilates the respiratory tract, relaxing, anti-inflammatory, disinfecting, antibacterial, strengthens the memory, stomach protective, vomiting, antiviral, anti convulsive. The information on this page about the use of cannabinoids (CBD) is intended as a choice aid for people who want to use cannabis as self-medication. Our express advice is to ALWAYS discuss this with your ARTS first. We make no medical claims. The information on this page is not intended to diagnose, treat, cure or prevent disease.